2. 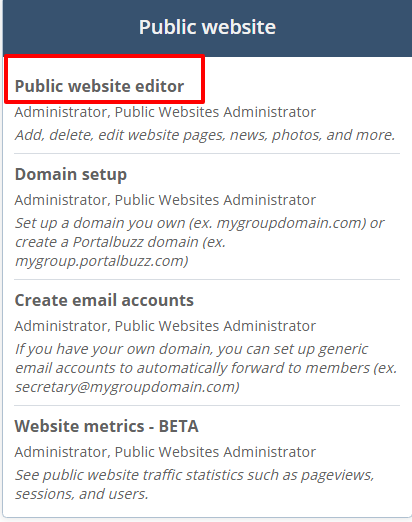 Locate Public Website Editor under Public Website heading. 4. Select the appropriate page from the list and click edit. If you want to add a new page for the registration, you can do so from this page. Click the Manage pages & menus article or video below if you need help in adding a web page. 5. Once on the page, click on the content box where you would like to add the Event Registration, then click the Controls button in the edit bar. Select Event Registration from the drop-down menu and then click the Save and Publish or Save without Publishing button. 6. The Event Registration Control will display on the page. The image below shows how the event signup page will appear on the public website if you have both Members and Non-members configured. For members, click I am a Member and enter login credentials to view the registration page. For non-members, click I am a Non-member to view the registration page.